Most cat litter products are not completely dust free. There is still a chance that your cat will track some dust throughout your house no matter what product you buy, but the ones we want to cover in this article for you are the best ones to use to keep the tracking low. Now, we are going to show you some of the best cat litter products on the market that are not only safe for your cat and of high quality but also create little dust for you to have to deal with. There is a reason that the ökocat litter is considered one of the best that you can buy. Even though it is expensive, it clumps very well and leaves little to no dust behind for you to deal with. It is also a powerful odor blocker, keeping odors at bay in even multiple-cat households for up to a week. This extremely absorbent litter can take in up to five times its mass in cat byproducts, so you should have no problem leaving the litter for as long as a week without it making a huge mess. You may have a problem with your cat tracking some of it out of the litter box, and cats do like to play with the clumps, which they may eat or get stuck to their fur. 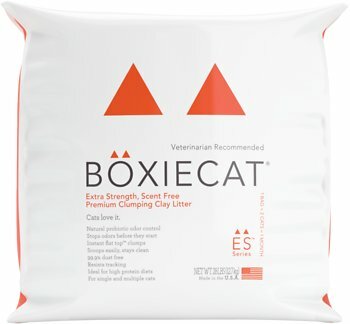 This particular litter is made for those sensitive cats who can’t use hard litter because it would be rough on their paws and who can’t be around strong scents. 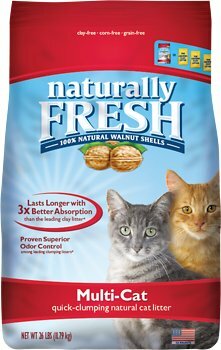 This unscented litter is decent at blocking odors, but not as good as some of the competition is. It’s still decent litter for a decent price, and there is really no dust to speak of. In fact, the manufacturer boasts it is almost 100% dust free. 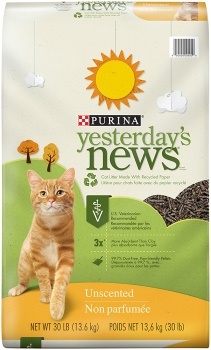 This litter uses pellets, which KitterCatter.com recommends as the best way to have a dust free litter. This litter will clump very quickly, so if you want to get rid of the litter as it is used, then you can, without dumping out all the rest of the litter box. The 100% biodegradable litter is safe for the environment and for your cats. It’s also potent enough for homes with multiple cats. If you have a sensitive cat that doesn’t like strong scents, then this is an ideal litter for them since it contains no fragrances or dyes. That can mean that it doesn’t kill odors as effectively as some other brands of cat litter, but it does a decent job. For every sensitive cat that has allergies and other sensitive issues, this as a good pick. It is made with hypoallergenic ingredients that keep your cat from having a bad reaction to the litter. It’s also priced to sell and offers one of the best values in cat litter. There is little dust for you to have to clean up afterwards, but it will be a bit dustier than some of the other choices on this list, so you ought to know that going in. 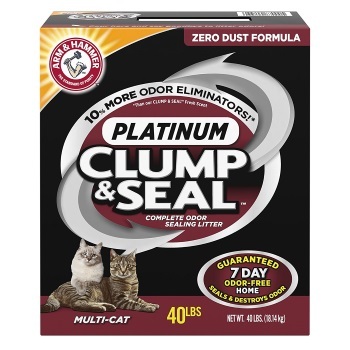 Considered by many to be the most cost effective and best value cat litter on the market, this Arm & Hammer product is great at eliminating dust tracking from your life. It also seals in odors and kills a lot of the bacteria that causes odors, making it one of the most effective odor eliminators you can buy. This powerful cat litter kills odors as soon as it comes into contact with them. It also clumps immediately and keeps odors from spreading and the litter from being overly saturated. That makes for some easy litter box cleaning and a mostly dust free litter box area. 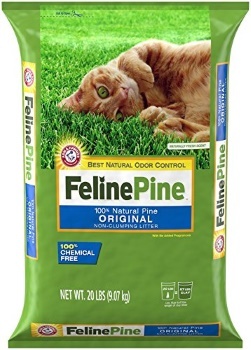 Some cats don’t like the smell of the pellets in Feline Pine’s cat litter, but most of them should not mind. It’s also kind expensive when compared to some other other litter products on this list, so you may want to do a price comparison before you decide on a litter to use. This is one of the gentlest cat litters for cats because it contains no odors to offend their sensitive noses. There are no fragrances or dyes, and yet this litter manages to eliminate odors very well. The price is decent for the amount of litter you get, and there should be almost no dust at all when your cats use the litter box. On the downside, it may not always clump, and that inconsistent performance can make it frustrating for some cat owners. According to Petful101.com, using dust free cat litter is a good way to reduce some health risks associated with litter dust. That’s why Blue Buffalo’s cat litter product is a good option. It creates very little dust since it clumps quickly and effectively. That ensures that your cats cannot track dust all over the house, but the clumps can stick to the cats’ fur, and that can spread the litter where you don’t want it. 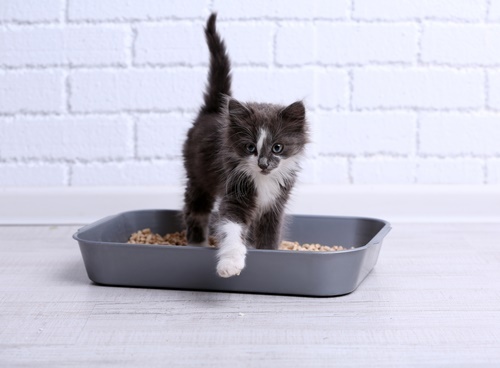 This particular litter is incredibly absorbent, and you can use the same tray full of litter for up to a week even with multiple cats in the house. After that, you will need to change it out. 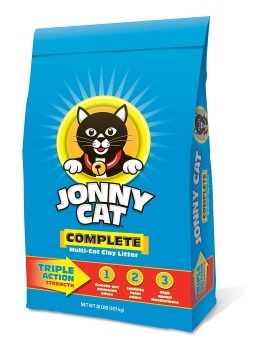 If you are trying to save money on cat litter, then Jonny Cat is the way to go. It is the cheapest option on this list by far, but it is also not very consistent. That means that sometimes it will clump okay and sometimes it won’t, and if you have problems with your cat tracking dust through the house, then that may be an issue with this cat litter as well. When it works, it does a wonderful job of keeping dust out of your house and odors from spreading, but if you want a better quality product, you are going to have to pay more for it. You should know that this is a scented cat litter, and that means that your cat may not like it much, if its nose is very sensitive. Most cats will be just fine with it, though, and the scent does a good job of getting rid of or hiding cat odors. If your cat’s litter has smelled really bad in the past, then you may want something this potent, but you need to be aware of the possible fragrant smell. It’s not for everyone. The value here is pretty decent, as you get a lot of litter for the price. 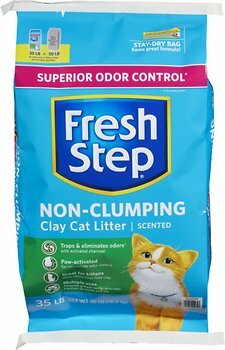 Plus, Fresh Step has created a litter that activates only when it is in use, so you won’t have to deal with the fragrance all the time, and your cat might not be bothered by it. 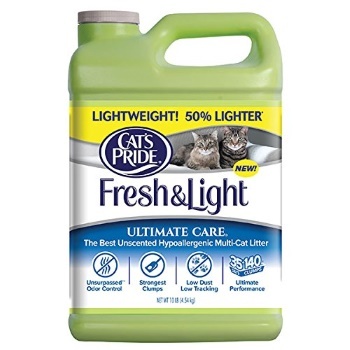 This is a great product for controlling odors, and it clumps well too, which makes it easy to clean up after your cat. Dust free litter will clump– Clumping litter is considered the best kind of litter by PetHealthNetwork.com and other reliable cat care resources, and that’s what most dust free litter is. This kind of litter is easy to scoop out and it is easy to just get rid of the litter that has already been used. Watch for muddy litter– Litter that does not create dust may go in the opposite direction and become muddy when it gets too soaked. You can avoid this by buying quality litter and by changing out the litter regularly. Know your cat’s preferences– Your cat may not like the litter you chose, even if you are happy with it, and you need to be prepared to change it out for something else. Try to start with a small bag of any new litter first to try it out on your cat. That way, you won’t waste much money. Beware of cat allergens and sensitivities– There are other things to consider when buying cat litter beyond how little dust it leaves behind. You also need to pay attention to whether it causes an allergic reaction in your cat or if it is something that is too strong smelling for your cat. Now that you have seen our choices, we hope you can find something that works well in your situation. You may have to try a few of these out before you find something that is compatible with your cat’s need and sensitivities, and one of these should be the perfect fit.